Patients with hereditary hemorrhagic telangiectasia (HHT) with severe bleeding, who were treated with intravenous bevacizumab, reported a marked reduction in nose bleeds and gastrointestinal bleeding and were able to stop or considerably reduce blood transfusions, resulting in significantly improved quality of life. A new study published in Mayo Clinic Proceedings provides good quality evidence for the excellent safety profile and efficacy of intravenous bevacizumab in the management of these patients. HHT, also known as Rendu-Osler-Weber disease, is a rare genetic disorder that affects blood vessels. Individuals with HHT have abnormal blood vessel clusters (referred to as AVMs or telangiectasias) that have a high propensity to rupture and bleed. This can result in hemorrhagic stroke, epistaxis (nose bleeds) and bleeding from the digestive tract. Patients can become severely anemic and blood transfusion dependent because of this chronic bleeding. Investigators analyzed the records of 34 patients who were treated with intravenous bevacizumab for severe HHT-related bleeding for 44 months from June 2013 through January 2017 at the Mayo Clinic HHT Center of Excellence in Rochester, Minnesota. The primary source of bleeding was epistaxis in 15 patients, GI bleeding in four patients, and combined epistaxis and GI bleeding in 15 patients. Most patients had tried and failed standard medical and interventional approaches to control the bleeding including ENT laser cauterization procedures, septodermoplasty and GI endoscopies. Red blood cell (RBC) transfusions had been administered to 28 patients. Of these, 16 patients were RBC transfusion dependent and had received a median of 75 RBC transfusions before starting treatment with bevacizumab. The typical initial dosing cycle consisted of eight doses (four doses each administered two weeks apart followed by four doses each administered one month apart) over a period of around 22 weeks. An Epistaxis Severity Score (ESS) questionnaire was used to assess the severity of nose bleeds at both at the beginning of the study and after starting bevacizumab treatment. Further “top up” or maintenance doses after the completion of the initial dosing cycle were individualized in each patient. Patients were instructed to maintain close follow-up with monthly laboratory checks with the aim to redose bevacizumab before the bleeding situation had deteriorated significantly. 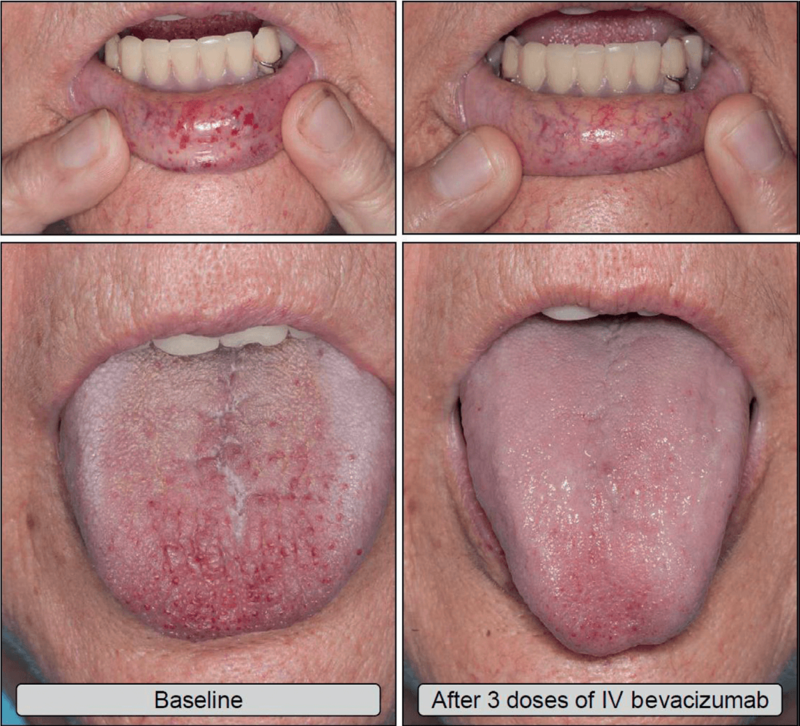 Improved mucocutaneous telangiectasias after intravenous bevacizumab treatment. “Currently, there are no FDA-approved pharmacological treatments available for HHT patients with severe bleeding. This study provides good quality evidence for the excellent efficacy and safety of intravenous bevacizumab in the treatment of these patients. Intravenous bevacizumab should be considered as a standard, first-line treatment option for HHT patients with severe bleeding and transfusion dependent anemia,” concluded Dr. Iyer. The article is “Intravenous Bevacizumab for Refractory Hereditary Hemorrhagic Telangiectasia—Related Epistaxis and Gastrointestinal Bleeding,” by Vivek N. Iyer, MD, MPH, Dinesh R. Apala, MBBS, Bibek S. Pannu, MBBS, Aditya Kotecha, MBBS, Waleed Brinjikji, MD, Michael D. Leise, MD, Patrick S. Kamath, MD, Sanjay Misra, MD, Kebede H. Begna, MD, Rodrigo Cartin-Ceba, MD, Hilary M. DuBrock, MD, Michael J. Krowka, MD, Erin K. O’Brien, MD, Rajiv K. Pruthi, MBBS, Darrell R. Schroeder, MS, and Karen L. Swanson, MD (https://doi.org/10.1016/j.mayocp.2017.11.013). The editorial is “The Current Role of Bevacizumab in the Treatment of Hereditary Hemorrhagic Telangiectasia—Related Bleeding,” by James R. Gossage, MD (https://doi.org/10.1016/j.mayocp.2017.12.019). They appear in Mayo Clinic Proceedings,volume 93, issue 2 (February 2018) published by Elsevier. A video accompanying the article is available at https://youtu.be/9_eEy_bHLhk. Full text of the article is available to credentialed journalists upon request. Contact Rachael Zaleski at +1 215-239-3658 or mcpmedia@elsevier.com to obtain copies. Journalists who wish to interview the study authors should contact Vivek N. Iyer at Iyer.Vivek@mayo.edu. James R. Gossage may be reached for comment at jgossage@augusta.edu.